"If you can fill the unforgiving minute / With sixty seconds' worth of distance run, / Yours is the Earth and everything that's in it"
After yesterday's route notes promised unblemished tarmac and ended in a scene from "The Bridge Over The River Kwai", today's note predicted a long stretch of unmade road to the delight of the KTM riders among us. What we got was, yet again, something completely different. The first 100km followed our particular tributary of the Bhramaputra through a spectacular gorge (see photo) to a placid lake. A magnificent ride that made the heart sing. Not all straightforward, recent rains had washed mud and rock across the road in places so care was needed. At one point the road had partly collapsed and a river had taken its place. No match for an adventure bike, but several Chinese cars were getting stuck on boulders and were blocking the way. With a bit of makeshift civil engineering and some manhandling everyone eventually got through. At the end of the lake the road split. The right hand fork led to the Indian border and Myanmar (Burma). We took the left hand road which climbed into a narrow gully. At times this was no more than 20m wide with a raging torrent at the bottom. The road was cut into the sheer face protected by an avalanche cover which had seen recent use. We emerged onto high pasture with yak and cows grazing on either side. Then the road turned north and started to climb up a side valley. This was where the off-road was meant to start but, in the two years since the last trip, it had had been paved. Instead of gnarly rock and sand, we were treated to 30km of tarmaced hairpins to rival any Alpine pass. Sensational. 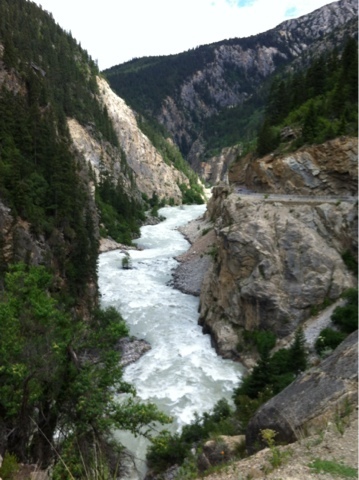 As we descended and followed yet another swollen river, the rain started and continued until we reached our hotel. As Deefor types this blog it is still raining hard. So who knows what tomorrow will bring. What a day. Certainly one where every unforgiving minute was filled with adventure. What a stunning photo, thanks for sharing it with us!